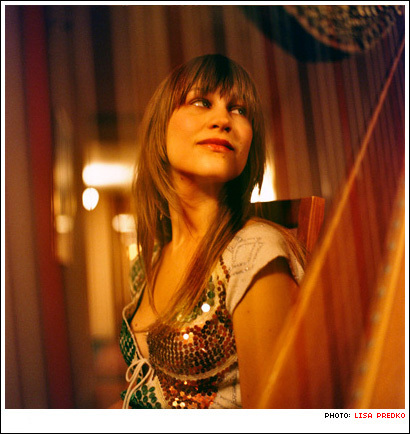 I’ll admit that I’m not much of a Joanna Newsom fan. I didn’t like either of her previous releases, The Milk-Eyed Mender or Ys. I wanted to like her music, because she oftentimes gets lumped in with musicians whose work I do enjoy, but I just couldn’t get into her whole sound. Regardless of my own personal twitchyness over the anti-folk harpist’s style, she’s got the internet all abuzz with her forthcoming triple-disc (!!!) release, Have One on Me. Consequence of Sound has the latest news on the new release, and Fan Made Recordingshas a recording of a recent show in Australia where Newsom performed many of the songs which will appear on the new album. Her label, Drag City, is streaming “’81”, a track from the new album (look in the right hand column, under “Free Music”). As for me, I think I may have to revisit Newsom’s past releases. My musical world has expanded since the 2006 release of Ys, so maybe this time, I’ll like what I hear. The entire internet seems to be talking about the benefit show on Saturday at the Music Hall of Williamsburg… and with good reason, as I have it on authority that the show was pretty awesome. Performers included St. Vincent, Justin Vernon, Britt Daniel (of Spoon), My Brightest Diamond, and comedians Zach Galifianakis and Janeane Garofalo (whose names are impossible to spell). Stereogum has video of Justin Vernon and Annie Clark performing Neil Young’s “Harvest Moon”. Brooklyn Vegan, who helped put the show together, has a recap, videos, and a ton of fantastic photos of the show. Pitchfork has more videos, including a cover of Prince’s “How Come U Don’t Call Me Anymore” by Shara Worden (My Brightest Diamond). And So This is What the Volume Knob’s For has their own in-person coverage, including photos and video. Loud Loop Press has a list of ways that local Chicago artists have been getting involved in raising money for Haiti. And if hip-hop is your thing, Reggie’s Rock Club in the South Loop is having a benefit show on the 31st, with proceeds going to Every Drop Counts (a newly formed grassroots organization that unfortunately picked a name already used by a non-profit trying to protect Lake Michigan, so boy was I confused when trying to find a link). A.A. Bondy and band stopped by Hear Ya to record an acoustic session. Video and MP3s are available. I don’t think I need to tell you how fantastic this guy is. While we’re at it with free music for your listening pleasure, Fan Made Recordings has The Decemberists’ January 19th set from Sydney, Australia. And Web in Front has a Coachella-inspired mixtape, featuring 20 songs by artists slated to perform at this year’s festival. Popdose provides an extensive look at the music and career of Patty Griffin. Her new album, Downtown Church, is available now. Local Chicago punk-rock-ish quintet Bully in the Hallway is profiled by Consequence of Sound. You can catch the band this Thursday at the Double Door, for free. My Old Kentucky Blog reviews Saturday’s show by Alejandro Escovedo in Louisville, KY. Looks like the show was pretty intense (in a good way). You can catch Escovedo in Chicago on April 3, when he does two shows at the Old Town School of Folk Music (although I think both shows are sold out). Canadian band Woodpigeon share their cover of “The Log Driver’s Waltz”,a song made famous by Kate and Anna McGarrigle. And in the “this can’t possibly end well” department, the Department of Justice approved the Ticketmaster/Livenation/All Your Fees Are Belong to Us merger, with a couple of conditions (including selling off a division which handles college sports ticketing — to Comcast, prohibiting against retaliation for venues who choose to use competitors, and licensing its proprietary software to a main competitor). These conditions do not, of course, include changing the system so that fans have a better shot at getting tickets than brokers, getting rid of those “convenience fees” which jack up the price of a ticket, or ceasing to charge people for the privilege of printing their own tickets using their own printers. See Rolling Stone, the Wall Street Journal, the New York Times, BusinessWeek, or TicketDisaster.org for information.